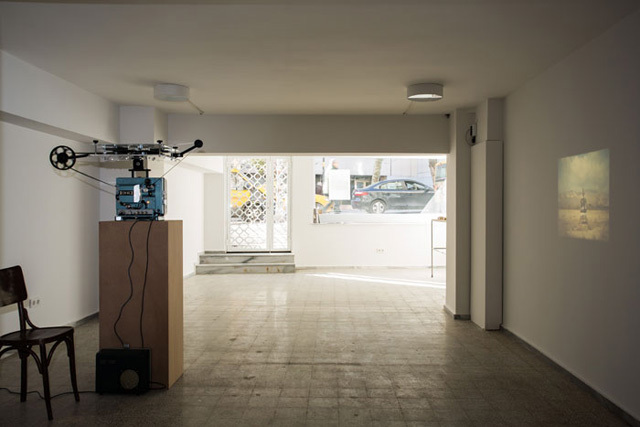 Jacob Kassay’s works—exhibited in Istanbul recently through Protocinema at an empty storefront—explore the materiality of his media. The exhibition includes three works—a film, an installation of transformed library books, and Kassay’s renowned silver paintings. 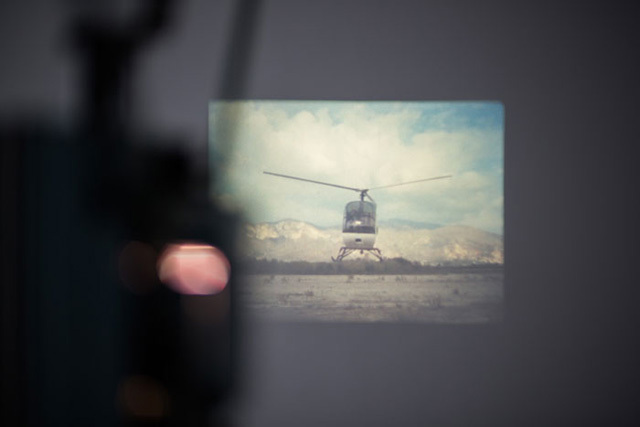 The 16 mm film, Untitled (2011), shows a helicopter rising above the ground in the desert. The rotation of the helicopter’s blades synchronize with the frame rate of the recording camera, 24 frames per second. The synchronization of the two machines, the camera and the helicopter, create an image of stillness, canceling out the motion that keeps the helicopter in the air. The glass wedges, now nested in books from local libraries, point to the functionless aesthetic that is produced by the wedge’s placement in the otherwise circulated, used object of the book. The wedges become a lens that add a physical third dimension to the book pages, foregrounding the materiality of these objects. Installed on a table near the window of the storefront, this specific installation of the works mimic a book store—an understated gateway to the film and the paintings. The silver paintings, almost disregarded, are tucked away, the end products of a process-driven approach to painting in which Kassay produces reflective surfaces that are then situated in the specific architectural context. As he states in a recent interview, “The whole point is that the thing is being absolutely transformed, also that I was somehow removed in this process, all I had to do was develop a support for the catalyst and then it was then out of my hands but this is not unfamiliar territory for painting.” As Lara Ögel, an artist whose work is about building very specific relationships with her found objects and materials on print, points out, Kassay’s work is about keeping a distance from the contents of the site-specific to explore the media that he tampers with. Installation, Jacob Kassay, Protocinema, Istanbul, 2013. Courtesy: Protocinema, Istanbul; Art: Concept, Paris; Xavier Hufkens, Brussels, photos Batu Tezyuksel. Lara Ögel: I know that your works responds to specific spaces and that spaces you have exhibited in respond to your works, as well. Let’s talk about the placement of the works in your show at Protocinema. Jacob Kassay: It took a while to find a spot for everything. There is no lighting used in that show other than the natural light which comes through the front window. This determined where we placed everything. The books needed a lot of light, while the film needed the dark so we positioned the projector in the center of the room – one of the points with the least light. The paintings are laid on their sides horizontally in the back section of the room, taking on the ratio of the wall on which they lean. This is how they rest all the time in my studio and I enjoy dealing with them as objects, which I see out of the corner of my eye, rather than as paintings, which are hung on the wall face forward. On the floor, they call attention to the peripheral space around them as their surfaces absorb different ambient colors, tones and materials. Right now, they rest in this way but this is just one potential position. They can rest other ways in other spaces in the future. In this way too, the positions of the glass wedges inside the library books are necessarily temporary. The wedges don’t belong to any particular book but rather shift from book to book like a hermit crab, finding the other book that precisely fits it. This is why I chose to house them in library books – as a kind of format logic which focuses on their qualities as objects, rather than as texts with specific content. 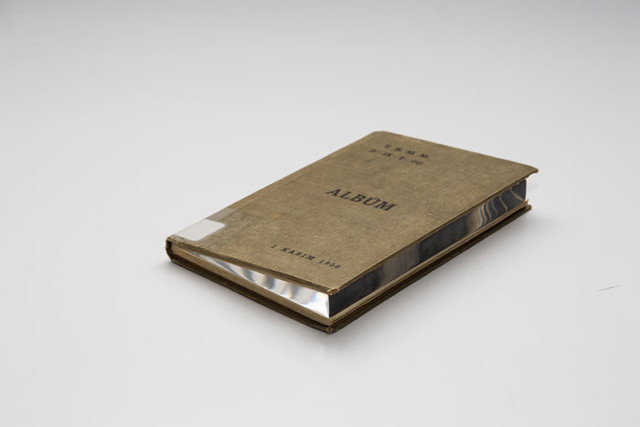 Untitled, 2012, glass, borrowed book, glass – 15.5 x 10 x 1 cm, book – variable (11). Courtesy: Protocinema, Istanbul; Art: Concept, Paris; Xavier Hufkens, Brussels, photos Batu Tezyuksel. LÖ: But because of the local context of it, what I experienced was the book. You had this one book that I’ve been obsessed with titled “Prayers Read To The Dark” (Karanliga Okunan Ezanlar). Weren’t you curious what it was about? JK: I wasn’t. Because I couldn’t read any of the materials, this allowed me to approach the project where the determining factors were the dimensions of the wedges and what was available from the library, instead of the content of the books. Finding a book that fits is difficult enough. LÖ: I’m looking forward to hearing about them traveling- to see what will happen. With that said, are the silver paintings and these wedges going on the same path? Installation, 2012, glass, borrowed books. Courtesy: Protocinema, Istanbul; Art: Concept, Paris; Xavier Hufkens, Brussels, photos Batu Tezyuksel. 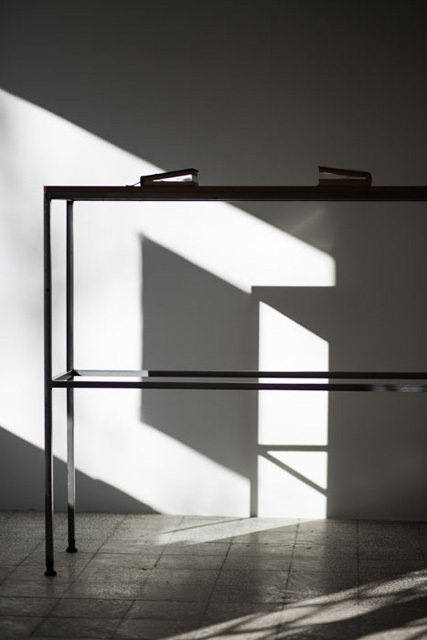 LÖ: That’s how I interpreted them – inhaling the content and reflecting it back. JK: With both groups of work, I have tried very hard to make it so that each contains a natural logic that dictates how they’re suppose to function once they leave my hands. LÖ: Tell me about the film. JK: I’ve been working on it since 2007 and the interest was generated from understanding that the frame rate of a film can be brought into consonance with the rotor speed of a helicopter. When you are watching movies, you will notice that the helicopters look strange. You know that the mechanics of a helicopter and the components of the cameras they are working with are similar, so I had the thought that they could come into sync. I felt that there was a relationship between the two – the helicopter and the projector with a looper that the film is placed on. There is an overlapping formal relationship between the two where the sounds are so similar that you can’t tell what’s the projector and what’s the helicopter in the film so both are objectified in the end. The helicopter’s blades are apparently not moving yet there is movement in the frame. You have the same thing going on with this projector and looper, which creates a type of standoff or symmetry. Installation, Untitled, 2011, 16 mm film installation, 27 minutes. Courtesy: Protocinema, Istanbul; Art: Concept, Paris; Xavier Hufkens, Brussels, photos Batu Tezyuksel. LÖ: It was quite an experience for me, in how you addressed the speed and the sound of the helicopter. Do you think you’ll experiment more like this? JK: I don’t know. I always, kind of, work towards these experiences. Because I couldn’t find another subject or relationship other than the one I was interested in finding absolutely, I doubt that I’ll make another film. LÖ: I want to ask you a bit about your exhibition at the Kitchen. I read there was a musical performance for the opening and I had read in your previous interviews about how when you were a student you were a part of a space where a lot of artists and musicians all produced work under the same roof. I was wondering how the exhibition at The Kitchen was similar to that? JK: Kevin Shea was one of the drummers, and the other drummer was Will Redman. It’s not the first time I have worked with musicians but it’s the first time I had worked with either of them. I knew Will when he used to live in Buffalo while he was getting his Ph.D in Music and Composition. Later, I met Kevin through Rhys Chatham, with whom I’ve done a couple of collaborations. The important aspect of the Kitchen performance was that I was having these drummers interpret scores. The drum notation’s paper was treated with oil so that the score included both the notes on the front of the paper as well as the notes on the back of the paper, interlaced into one another. One drummer was placed in the theater and one drummer was placed in the gallery, which meant that whenever there were breaks in the score you could hear the other drummer playing in the other space. Placing them on these different levels of the building made it so your engagement with either performance was always interrupted or inflected by the presence of the other. LÖ: Did you want the viewers to experience this constant missing out on the whole thing, as you described? JK: I think so. It was made so that people would hear the music throughout the building, finding different points of privilege from one space to another. Other parts of the show addressed the kitchen as a building. The works were placed not just in the gallery but also in the offices, in the theater, in the entranceways. I wanted to highlight how the Kitchen was built – as an act both within itself and out through the community. Posted in content, on artists and tagged Jacob Kassay, Lara Ögel, Protocinema. Bookmark the permalink.